Comment – Wehring’s Way – Helix: A Corking idea? 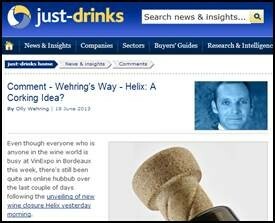 Even though everyone who is anyone in the wine world is busy at VinExpo in Bordeaux this week, there's still been quite an online hubbub over the last couple of days following the unveiling of new wine closure Helix yesterday morning. Cork producer Amorim and glass bottle manufacturer O-I have spent four years on coming up with what the two claim is the first major innovation in the wine bottle closure arena since the turn of the century: It's a cork that screws out of and into a bottle by hand, thanks to a thread on the inside of the bottle's neck. From what I saw, initial feedback on the idea on Twitter was more con than pro, although that's often the case when it comes to innovation - "We fear change". My initial reaction was: "I quite like it". Too often, innovation isn't given space to breathe, and new ideas get snuffed out before they've hit the high street. Besides, I think there's something novel about being able to turn a cork out of a bottle by hand, then reseal it with the same cork. Isn't there? However, there are two causes for concern that I can see on Helix's horizon. Firstly, well, it's still cork. The closure has been under attack for as long as I can remember for failing to fully eliminate Trichloroanisole (TCA). My fear is that changing the way one extracts the product from the bottle won't do anything to counter such charges. Secondly - and possibly more crucially - it's the economics. In the initial announcement, Amorim said that the new closure can be “quickly and easily implemented” by wineries with “only a minor adjustment” to the existing filling lines. However, a spokesperson for Amorim was quoted by UK trade publication The Drinks Business as saying: "There will be an innovation premium to pay, absolutely." The companies are targeting the still wine segment of the market with the new opening. It's fair to say, however, that the still wine segment is no longer swimming in money, with volumes taking priority over value. Are companies going to be prepared to spend some of their already slim profits on these "minor adjustments"? But, look; this is something new at a time when innovation in the wine industry is fast becoming a necessity rather than a luxury. So, let's give Helix a chance, sure. But, there are clear hurdles before the long-running closure debate closes once and for all.